US teachers have gone on strike to draw attention to education funding. Teachers’ strikes in West Virginia, Oklahoma, and Kentucky are drawing attention to the dire state of public education funding in those US states. 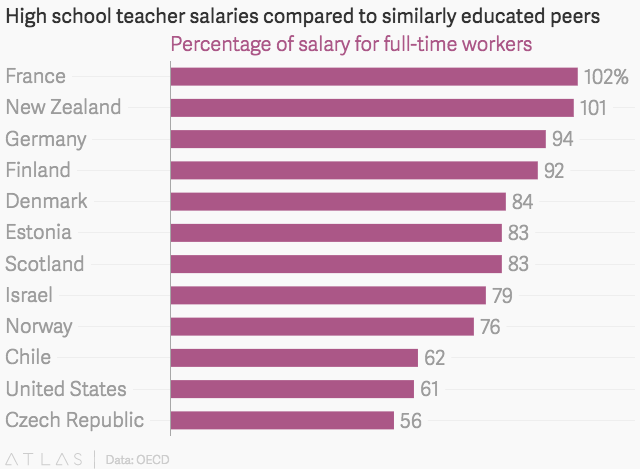 But failing to value educators is a nationwide problem—US teachers overall make some of the lowest relative salaries of educators in any developed country. After going on strike last month, West Virginia’s teachers won a 5% raise for themselves and other state employees. Last week, Oklahoma’s governor signed a bill that would give teachers a $6,100 pay raise. But the Oklahoma teachers union says that doesn’t begin to address the larger systemic problem of state tax cuts that drain funding from public education. “This package doesn’t overcome shortfalls caused by four-day weeks, overcrowded classrooms that deprive kids of the one-on-one attention they need,” the union says.